Well, at least the headlines in the MSM are not as misleading as they were for the A Levels. 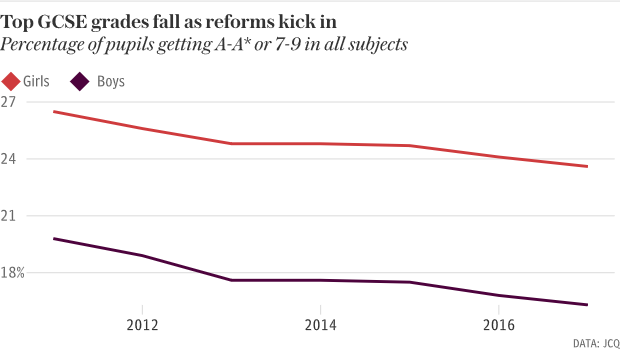 Girls are doing emphatically better than boys, as they have been doing since GCSEs replaced O Levels in 1987. A new grading system was introduced this year for pupils in England in three subjects: English Language, English Literature and Maths. The new scoring has 9 as the top grade, and this represents a higher level of performance than the previous A* (which is equivalent to a new grade 8 or 9). The graphic which heads this post shows the results by gender in this top grade. Roughly twice as many girls got top grade 9s (the caption claims 60% of grade 9s were for girls, but I think this is an under-estimate). However, this is partly because there were two English subjects, in which girls do better, but just one subject, maths, in which boys do better. Boys got roughly 40% more grade 9s in maths. But girls’ dominance in English was more emphatic – with about twice as many girls getting grade 9s in English Literature, and nearly three times as many in English Language. Achieving top grades at GCSE is significant because this is a reliable indicator of A Level performance – and hence university entrance. For example, your chances of getting an A* at physics A Level if you did not get an A* at GCSE are virtually zero. 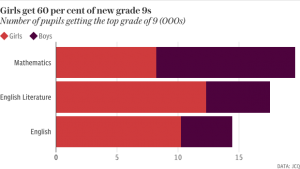 Of greatest interest is whether Michael Gove’s changes to the examination system involving the downgrading of coursework would lead, as many expected, to a reduction in the gender gap. It has not. It is usual to concentrate on nominal ‘pass’ grades, defined as grades C to A* under the old system and grades 4 to 9 in the new system. (NB: In the new system the pass mark has been lowered; an old grade C is midway between new grades 4 and 5). Over all subjects, girls have an average pass gap over boys this year of 9.5%, compared to 8.9% in 2016. In fact the gender gap has been roughly around 10% for the last 25 years (see here). Girls have widened the gap particularly in English language – despite the introduction of a reformed GCSE in the subject which features less of the coursework which many supposed favoured them. The results for England show that 70.9% of female entries were awarded at least a C (or 4) grade, compared with just 53.5% of males. 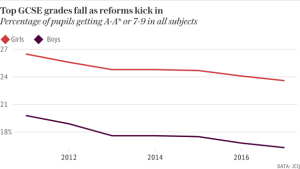 That 17.4% gender gap compares to last year’s 16.1%. And when grade 7 (or A) or above is considered, the gap is even more emphatic – more than double – with 18.5% of girls achieving these grades compared to 9% of boys. Finally, as seen above, at the top grade 9 in English Language there are three times as many girls. So, the higher the attainment level examined, the more dominant are girls in English. (These data from here). However, in maths the results for England show that 16.5% of male entries were awarded at least an A or a 7 grade, compared with 14.7% of females. 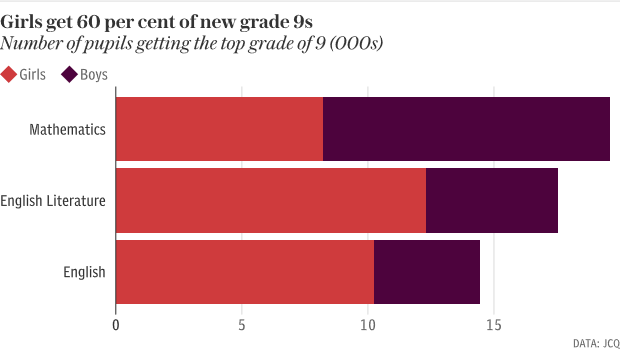 Hence there is a gender gap in favour of boys in maths at these grades of 1.8%, which is larger than last year (0.8%), though still rather small. A word of caution: I have not yet seen the absolute numbers of candidates – so it is possible that this greater percentage of boys doing well in maths does not mean a greater absolute number of boys doing well. Last year, maths was the only subject in which boys received a higher proportion of top grades than girls. But this year, boys have done better than their female peers (based on this metric) in maths, physics, economics and statistics. Next year it may get far harder to compare results by gender. The exam boards are actively consulting with charities, including Stonewall, the lesbian, gay, bisexual and transgender charity, with a view to record results against three gender categories next year. Obviously, mra-uk officially supports proceeding directly to the use of all 57 varieties of gender immediately (or is it 157, I forget). This entry was posted in education on 24th August 2017 by William Collins.